The Prep Wife: Let's Talk About Camels! 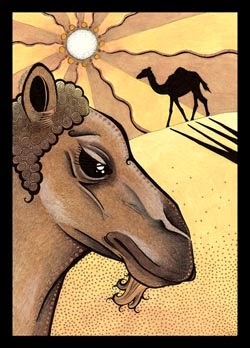 cam·el (ˈkaməl/) noun: A humped, long-necked ruminant mammal of the genus Camelus, domesticated in Old World desert regions as a beast of burden and as a source of wool, milk, and meat. Little known fact about camels: they have reservoirs of energy in their body so that they are able to hold on and persevere during challenging times. This magical phenomenon is also known as The Dessert Stomach. I'm sure I am not the only one who is "blessed" with The Camel or The Dessert Stomach. Some days I embrace it; other days I regret it. I wish I had other Camel qualities... Maybe their super long legs. Here is an amazing cookie recipe that you must try! Fluffy, soft, chewy and oh-so-chocolatey Giant Double Chocolate Chip Cookie. 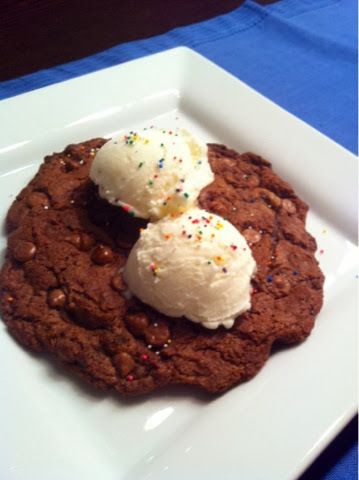 The recipe yields only one giant cookie so it's perfect if you want to indulge but still limit yourself. I use the word "limit" loosely. It is a GIANT cookie after all. 2. Cream the room temperature butter and sugars together. 3. Add the egg, vanilla extract and sift in all the dry ingredients. 4. 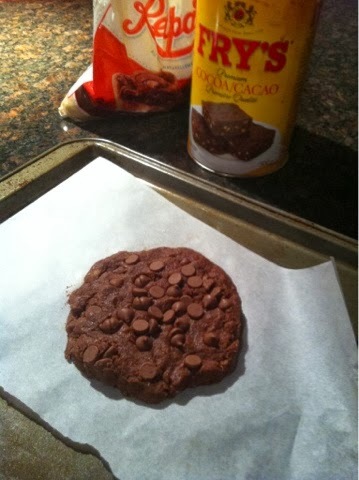 Mix together then add 3 tablespoons chocolate chips. 5. Put the cookie dough on a cookie sheet lined with parchment paper and form it into a ball. 6. Flatten the cookie dough ball slightly and add the remaining tablespoon of chocolate chips and press them in lightly. *Make sure that the edges of the cookie are not too flattened out so that the cookie bakes evenly and the edges do not crisp too much. 7. Bake for 14-15 minutes. The middle will still look somewhat under-baked but that is what you want! It will firm up a bit once it is out of the oven. 8. Let the cookie sit on the baking sheet for a few minutes before you move it so that it does not break. *Top with ice cream and sprinkles (because everything is nicer with sprinkles!) Enjoy! hahah double chocolate cookie like DOUBLE camel hump!! !